Des Moines Events, Coupons, Reviews! It all started one cold night when our son, about 7-years-old at the time, mentioned a show called "Doctor Who." He had heard one of his favorite YouTube stars mention it. Wanting to know whether this show was appropriate, I did some research, found the newer series on Netflix, and invited my husband to watch it with me that night. One episode turned into two, two episodes turned into three, and—well, you get the point. Our son, thanks to the help of a YouTube sensation, had turned his parents into Doctor Who fans. And thanks to our son, you get to see this awesome Dalek costume tutorial for kids! * This post contains affiliate links. If you make a purchase through one of these links, I may be compensated. Please read my full disclosure. Two years ago, we attended Time Traveler's Weekend at the Ohio Renaissance Festival. We thought, What better way to "time travel" than by turning our children into Doctor Who characters again? 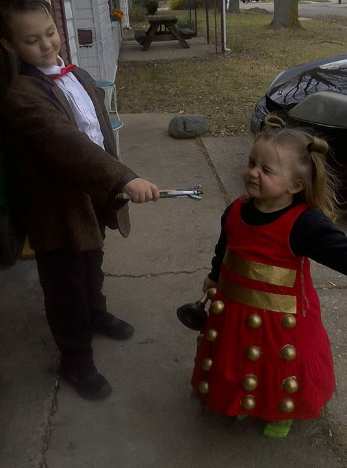 They both love Doctor Who, so we knew they'd be willing to participate. 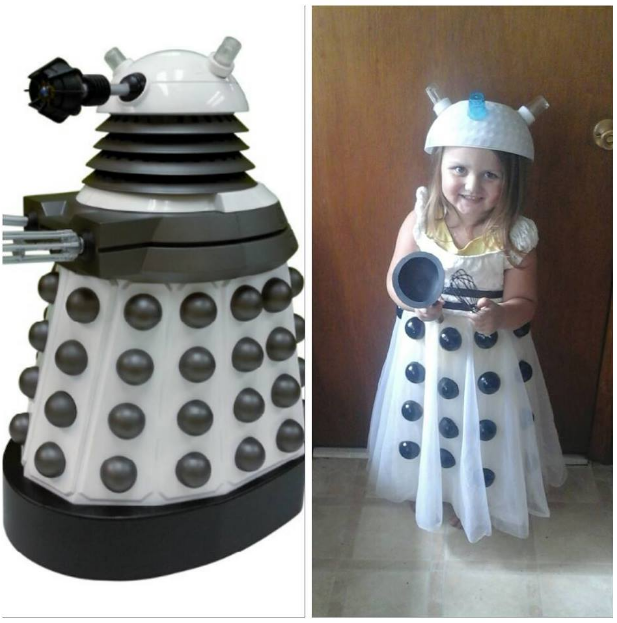 Note: This post is only going to cover how to make a Dalek costume for kids. 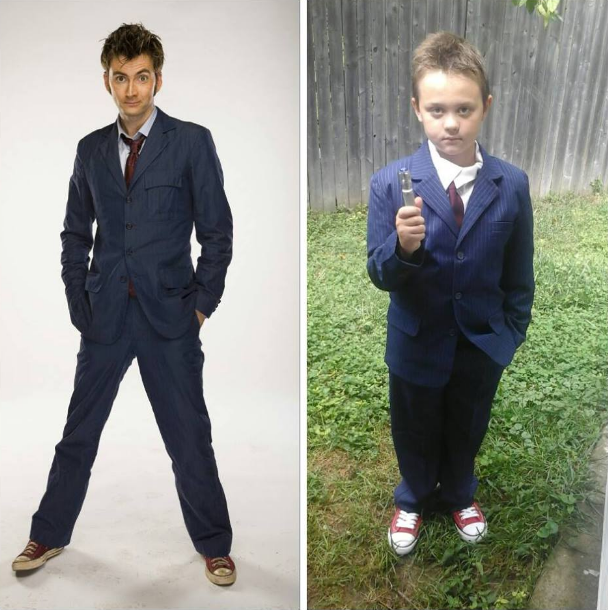 I went over how to make a kids 10th Doctor costume in another blog post. If you've searched for kids Doctor Who costumes, you probably know by know that it's a pain. I could not, for the life of me, find what I needed, even after days of scouring the internet. Any outfit that had the "Doctor Who" name on it was way too expensive for our budget. That's when I decided that I had to improvise. I had to make our own. Our daughter had originally told us that she wanted to be a fairy for the festival and Halloween, so I had picked up this beautiful dress. Then she decided that she wanted to be a Dalek! I wasn't going to buy a new dress so I had to turn this "fairy" dress into a Dalek costume. Note: Last year, for my daughter's red Dalek costume, I used plastic Easter eggs, spray-painted gold. This year, I opted for the balls because they're perfectly round, lighter, and easier to work with. First things first, I cut the ball pit balls into halves. The plastic is super soft, easy to cut, and can be easily spray painted without eating through the thin plastic. ...stick the scissors into the hole that you made and then to cut the rest of the way around the line. You'll have two half-spheres for each ball that you cut. I continued until I had 20 half-spheres. I ended up using 20 for her dress, each spaced 3 inches apart vertically and 4 inches apart horizontally. I would advise making several more, just in case something goes wrong—that way, you won't have to cut more, paint them again, and wait for them to dry. Gather the half-spheres and your plastic bowl. Take them to a well-ventilated, well-protected area (you'll be spray-painting them). Paint the semi-spheres with black paint (or your color choice) and the bowl with white paint (or your color choice). Allow each item to dry for at least an hour in between coats. Once they're finished, allow a full 24 hours to dry completely before applying to the dress or adding decorations to the helmet. While your accessories are drying, begin measuring where you'll place the balls on the dress. You will want your child to wear the dress while you're measuring. It makes it easier to know how the dress flows. I made a note to place the semi-spheres where the pleats came outward. I didn't want them tucked inside where the tulle dropped inward. If I had done that, they wouldn't be visible. I started at the waist line and decided that I would place the first semi-sphere row about a centimeter below the waist line. I then decided on columns of four (each three inches apart) and rows of five (each 4 inches apart). I marked the columns with masking tape for reference. You will probably have to continue these steps a day later, once everything is dry. IMPORTANT: Before gluing anything to the dress, place a piece of cardboard under the first layer of tulle to avoid the glue adhering to the layers underneath. See the image below for reference. Begin placing your semi-spheres onto the dress and securing them with hot glue. I didn't feel that it looked enough like a Dalek, so I chose this sparkly black ribbon instead. I ran two horizontal rows about an inch apart (above the waistline) and only in the front of the dress. The reason I only ran them in the front of the dress was because it made the dress difficult to go on when I wrapped them all the way around. Just hot glue the ribbon in place and then start work on your homemade Dalek helmet. I used the above wood drill bit to "hand drill" (just spin back and forth) a [very messy] hole onto each side of the bowl. These holes are there so that the LED candle switch sits over them, allowing them to be turned on and off from inside of the helmet. ...making sure that the switch was visible on the other side (and that I was able to switch it on and off with ease). I then secured it in place with hot glue. ...and glued them directly over the LED candles. ...and glued it to the front of the helmet. Note: I ended up removing the blue "light" to readjust the position. I placed it further down, about 2 centimeters away from the rim. The helmet should look something like this. Because the bowl is so big, I had to glue foam inside of the helmet so that it fit more securely on her head. I made sure not to cover the tea light candle switches. That's it! Just give your child their "weapons"---a whisk and a plunger...and take a photo! Putting the entire outfit together took me about two hours (not including the time it took for the paint to dry). If I can do it, anyone can do it!